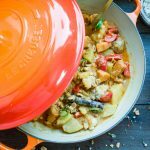 Vegan Massaman Curry and all you need is one pot and 30 minutes. Sounds good right? I love this dish, and usually, Thai cuisine is not really up my alley. I like to eat it, in fact, it’s what I choose when I eat Thai food. However, somehow I have never been pleased with the flavours. Until now. You will love it! I spent the week in Stockholm at one of my bests friends place. She is vegetarian and has a milk allergy. She also got a new vegan cookbook, of course, we had to try it out! 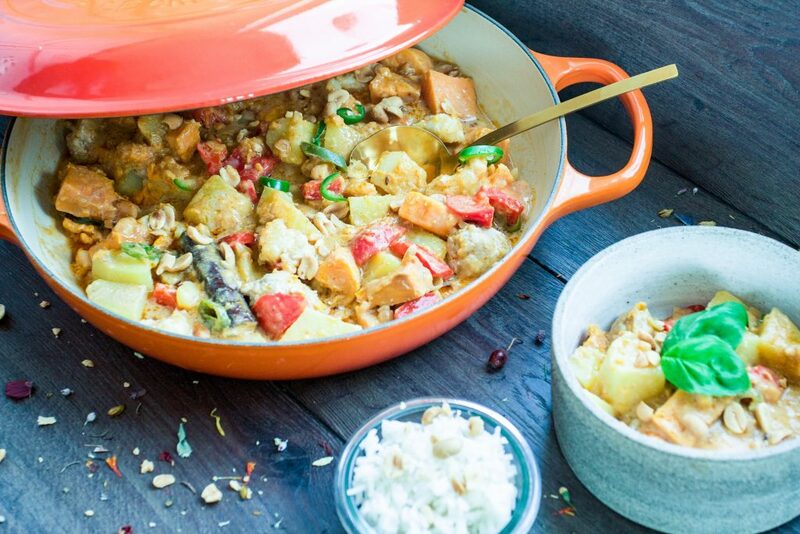 This Massaman curry is inspired by the Vegan Cashew Kitchen. Start by peeling and cutting the onion. Then sweet potatoes and potatoes. Tear the cauliflower into small bouquets. Cut the bell pepper and chilli into smaller pieces. Cook the rice, follow instructions on the packaging. Lower the temperature and add the peanut butter, salt, red onion and coconut milk. Stir until blended well. Add bell pepper and chilli when it's about 10 min cooking left. Top with crushed peanuts and fresh basil leaves. I would love to hear from you! Comment, share and love!